In the summertime, you’ll find outdoor grills selling corn on the cob everywhere in Greece. 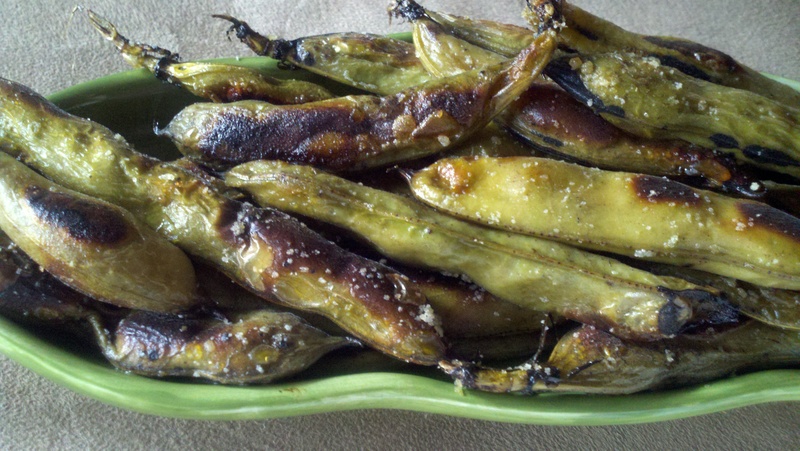 One afternoon I noticed a bunch of long green pods on the grill. 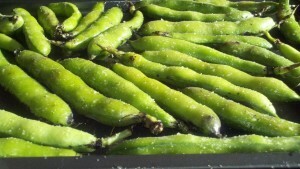 I asked about them and was told they were favas. The pods were slippery with olive oil and covered in salt which I found odd as I wasn’t going to eat the shell. 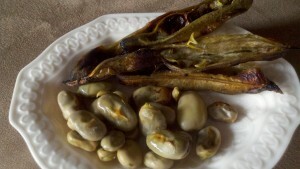 As I shucked a few pods and popped the beans into my mouth, it made sense.The oil and salt from my fingers had covered the shelled beans in the process! From that moment on, this is favorite way of enjoying fava beans. 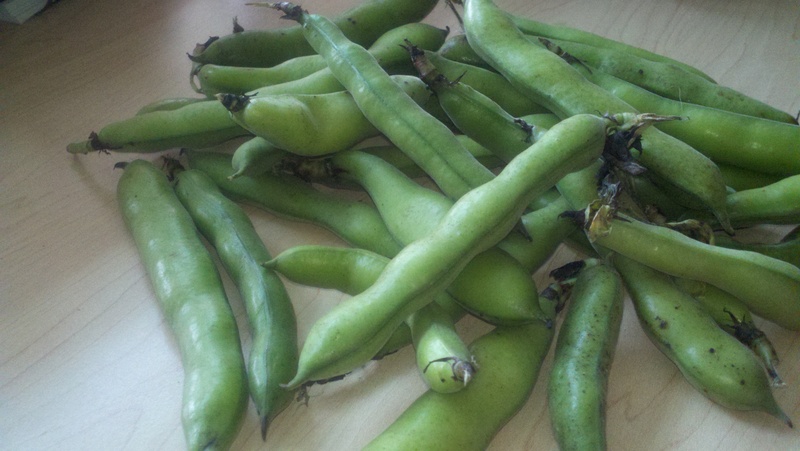 Spring and summer are the best times in the northeast US to find whole, fava bean pods. Though my local Whole Foods market does carry them sporadically in the fall and winter, farmers markets will have them from June through September. This recipe is equally good on the grill or in your oven. There is very little prep involved. Simply wash beans, dry, and toss with olive oil and salt. I recommend high heat parchment paper to line your pan as it makes cleanup just as quick and easy. Wash and dry pods well. Especially if they come from the farmers market or garden, make sure you get off all the dirt/sand. Do not clip the ends of the pods like you would do with okra. We want the beans to cook inside of the pods so they need to be intact. Toss pods with olive oil and generous amount of salt. Spread out over parchment lined baking sheet and cook at 450 degrees for 25-30 minutes. The pods will become charcoal black in spots. When fava pods are done, remove from oven and serve hot. Simply tear open the pod to reveal the most delicious, buttery-good baked potato flavored beans ever! Double, triple or quadruple this recipe to fit your needs. If you’re going to grill, follow the same prep and cook in a apiece of heavy duty aluminum foil on a hot grill for 20-30 minutes.